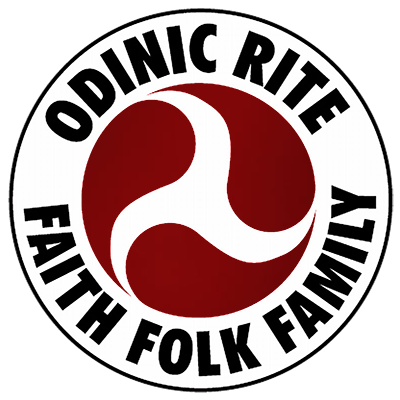 Like Odin himself, the mother of people bears many names – Ostara, Frigg, Freya, Hulda, Mother Cary, Frau Holle, Tara and many more. She is the most well-loved of our divinities. So well loved that even the malice of the Christian usurpers could not force the people to turn from her. Instead the Christians themselves were forced to accept her. The popular symbols of Easter – eggs, flowers, rabbits, new clothes, etc. are the old pagan symbols of Ostara. The attempt by the Christians to use this celebration of the “eternal return” as a vehicle for their own worship of suffering and death never really worked. The people still go out and “roll” eggs and buy their Eather eggs and chocolate bunnies, not replicas of Christian symbols. Ostara is the symbol to us of the coming New Age, the resurgence of life that will follow the cleansing fires of Ragnarok. We have claimed back her spring festival from the forces of winter and death. Ostara (Frigg/Freya), the mother of our race, is the symbol of love and the family, the symbol of the great feminine powers. But she is much more than any mere symbol. Ostara is a living and real spiritual entity, a warm and loving mother, a friend to turn to in fear and distress, who never rejects those who come to her. Our people have seen her as a feminine counterpart of Odin, Valfreya, the Lady of the Battlefield, a being of magical power who rides the sky, mail-clad, and leads the spirits of the slain to a spiritual resting place. Not only those who die in battle but those who lead lives of purpose and devotion, those who have loved and have been true and loyal. Ostara is a spirit of wonderful compassion, a compassion that passes beyond any conception of kindness or pity, an all-encompassing love above life or death. She is said to be the guardian of a fountain called Quickborn, the waters of rebirth. We can look to Ostara for magical protection and guidance in the magical arts. In the old mythology she is said to be a magician of great power and to have passed on her magical secrets to Odin. In Icelandic mythology (so sadly mistold) we are informed that this great goddess, personified as Freya, was one of the Vanir, and there is some indication that in Scandinavia Freya was considered to be a distinct personality. It is evident, however, that in Germany and Anglo-Saxon England there was no such division, that the names Freya, Frigga, Ostara, Hulda, etc. really referred to a single divinity. While there is a tendency in Odinism in general to refer to her as Freya, we use the name Ostara. It is a triumphant name, a symbol for the defeat of the cold death of winter, for the victory of the warm forces of life renewed. She is a symbol of hope for our people, as spring follows winter in exultant joy so too will we resurge into new life after the winter of this Dark Age. The bearer of Light and Life. To see the way before us. The Morning Light will come. This invocation is a useful means of preparing ourselves to meet Ostara in our dreams, but such elaborate proceedings are not necessary to make contact with her. Ostara is always near us once we become aware of her: the whisper of her name, the very thought of her, is enough to bring about the sense of her presence. So the loyal goddess of the hawk’s land commanded us. When the valkyrie’s ice met the skulls of men.